The task was to make use of all available space in a comparatively small kitchen, because every standard-size option and combination could not utilise all the space and relied on filler panels to complete the design. 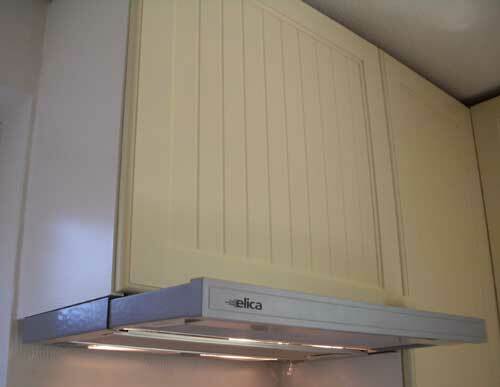 The material was to be medium-density fibreboard (MDF) throughout, because a painted finish was required. 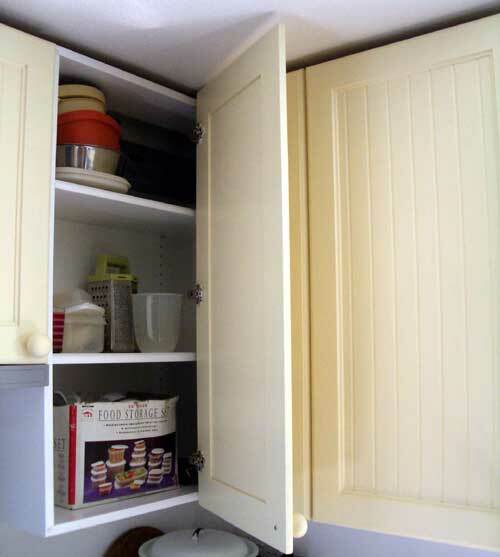 Cabinets need to extend vertically as close to the ceiling as possible, for maximum storage. Door construction was to be rail and stile, with inset flat panels with "Shaker" style shallow vertical grooves at approximately 45mm centres. Accurate measurements were the first step, then some initial design thoughts were modified and accepted. The project was to be completed in various stages, in order to minimise disruption, ease the production rate and spread the costs over a period. Work began in June, 2005. The first phase was to deal with the upper cabinets along two walls that met in an internal corner. An internal entry door was one boundary, the outside exit the other and a large 'fridge-freezer was another design constraint - wall cabinets were required to span this item. The final design included a large two-door cupboard with a central divider, to include adjustable shelving both sides. 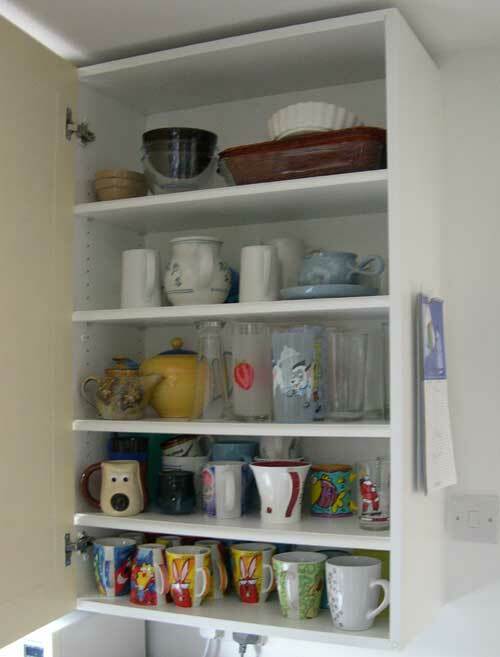 This was followed into the corner with an "L"-shaped corner cupboard with adjustable shelving and a double-action door. The shorter door opened independently, to gain access to the shorter side, but the remaining storage was accessed by continuing to open the door, which used pie-cut hinges to hang the smaller door off the larger one. 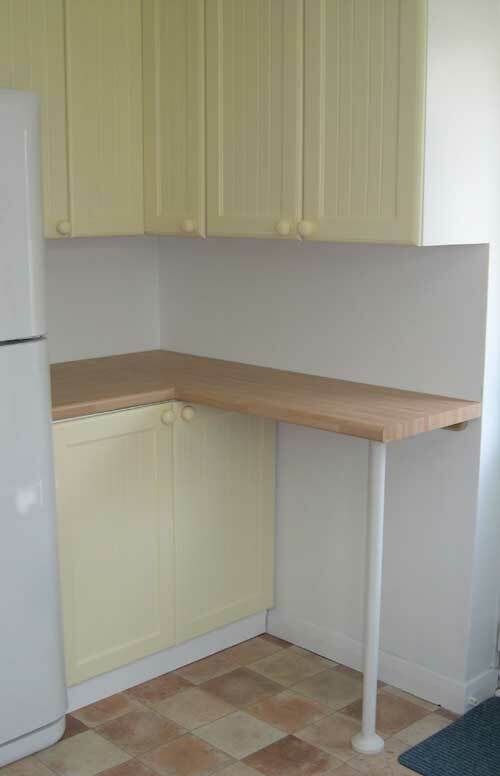 On the far side of this corner unit was a 300mm wide cupboard, again with adjustable shelving, which used the space up to the 'fridge-freezer. 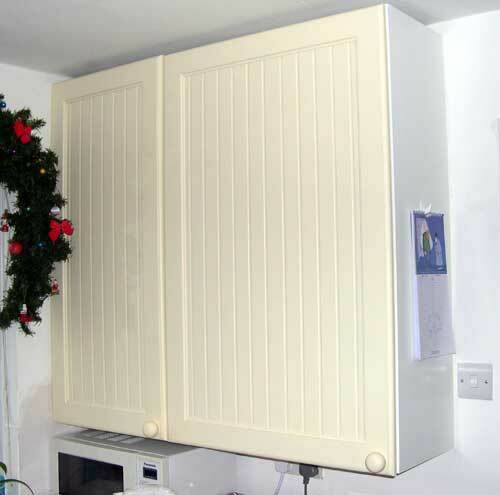 A smaller double cupboard was hung above the 'fridge-freezer. This also had a central divider and adjustable shelves either side. Once these units were made, they were hung on a double row of French cleats (incorporated into the initial design). The base unit was then made to fit below, in the space between the 'fridge-freezer and the corner. This was topped with an "L"-shaped worktop, with the open end supported by a wall batten and a corner dowel, with turned foot. This open space allowed access to the inner door and somewhere for the family pet to eat. The next element was the remaining corner units on the other side of the main window. Another "L"-shaped corner cupboard was to be used, this time assymetric to account for the consumer unit, located high up in the corner. This time, the larger door was to hang from the smaller, so the smaller door panel was beefed up accordingly to provide lasting and effective support to the hardware involved. The final phase was the base cabinets along the window wall. This included two 1000mm units that extended into the corners. 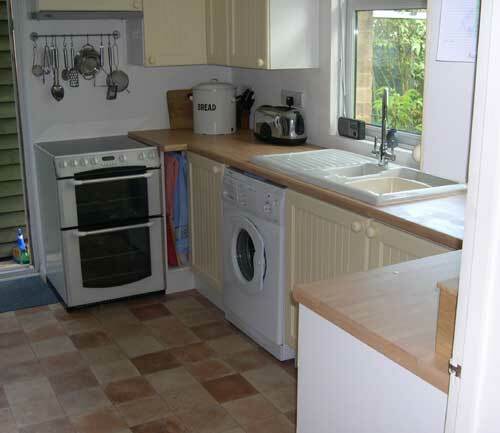 One utilised the space between the cooker and the window wall, the other the space between the wall and the drawer unit. Also required were the sink base unit and a four-drawer unit. The drawers were required to be of equal height and maximum width for the available space (between the worktop and an internal doorway). A 600mm unit would just fit, allowing for the offset from the corner unit to allow both to open correctly. Finally, a 600mm bay was needed for the washing machine. 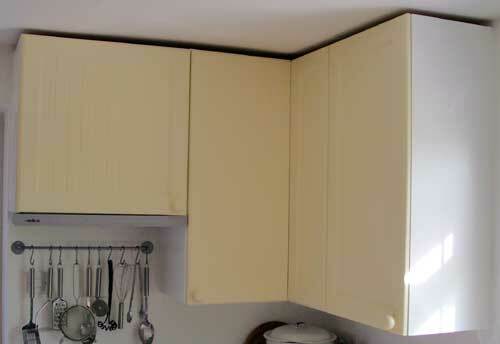 The corner units were to have one half-height fixed shelf. I decided to remove a portion of the shelf matching the door width and 100mm deep, in order to allow easier access to the far corner of the units. A profile was then machined onto the shelf recess to match the doors. The shelf was supported by a 18mm square insert, let in to a 9mm housing all round. 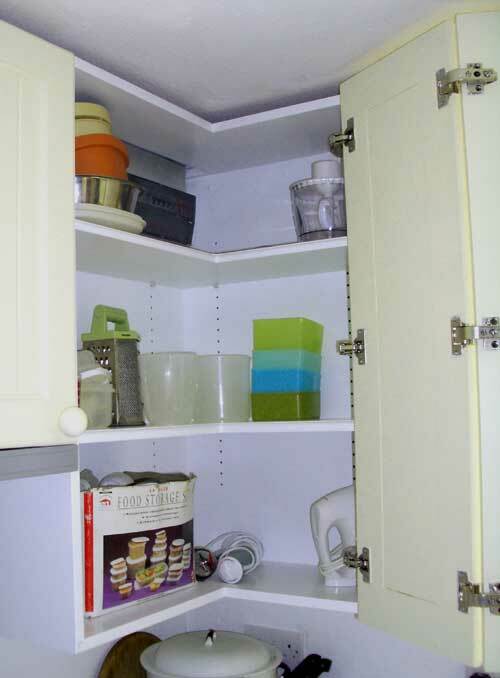 This, together with the removal of the access portion described earlier, meant that the shelves can be removed through the 500mm-wide doors for ease of cleaning. It's a fiddle, but it can be done! The base unit for the sink was constructed of Medite (water-resistant MDF), as were the kickplates (under-cabinet plinths). 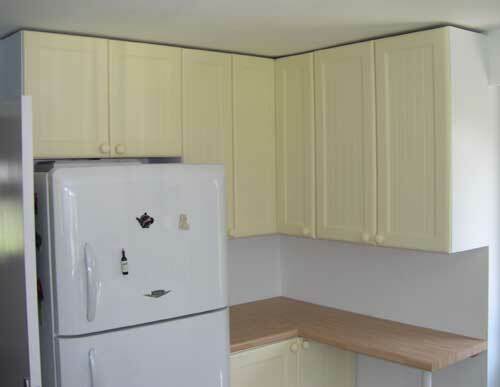 This was for extra peace of mind, even though the units were painted on every surface. The drawer boxes were joined using Isoloc™ joints, made with a template on my Leigh D4 dovetail jig. 12mm plywood was used for the bottoms, which were set in grooves in the front and both sides. The drawer backs were biscuited to the sides and the bottoms were inserted dry, then screwed to the backs from below. The drawer fronts were made from Medite - not only because of the water-resistance, but also because they take a sharp profile beautifully. The fronts were screwed to the drawer boxes from the inside, then the handle pulls went right through both front and box. This means that the pulling force is on the box, not just the front. The drawers operate via excellent Accuride™ stainless steel, two-part ball-bearing slides (35Kg capacity), which are self-closing and open to full extension. These prevent the need to ever have to reach into the back of a drawer, as they open with the back of the open drawer flush with the front of the one above. All cabinets are on adjustable legs - four for the sink base and drawer unit, six for the corner units. 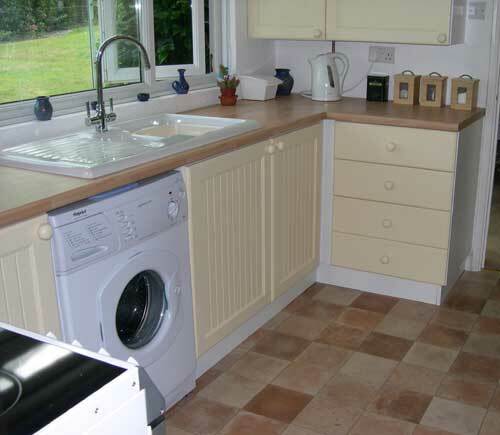 To utilise the space between the corner unit cupboard and the cooker, a tray space was constructed - supported on its own adjustable legs. A telescopic towel rail was fitted within this space. The sink base unit has a full-depth adjustable shelf which sits just below the waste trap. This allows the best use to be made of the space, which is enclosed at the back by a slide-in panel, cut to give access to the various water valves and taps (service valves for hot and cold, plus shut-off for an external tap connection. Washing machine connections were extended to terminate within the machine bay). 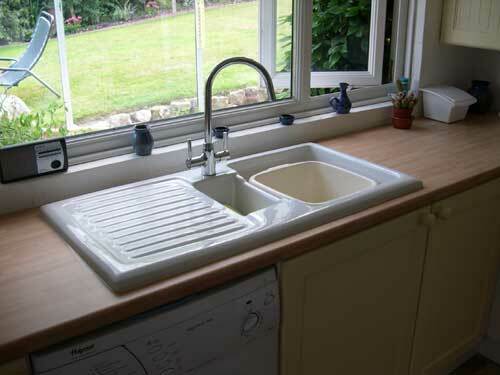 The sink is a cast ceramic unit, so is considerably heavier than either plastic or stainless steel. It does not need any fixing clips, but the insert hole needed careful cutting to prevent any lateral movement, which - in turn - could place a strain on the sink waste connections (hot and cold supply is via flexible tails).